A plastic cup is like the secret accessory to the party-goers outfit, so stand out amongst the ordinary people and their boring red cups, with a bright orange cup. With these Orange Plastic Cups your guests will immediately know they are in for a good time and that this isn't your average “red cup” party. 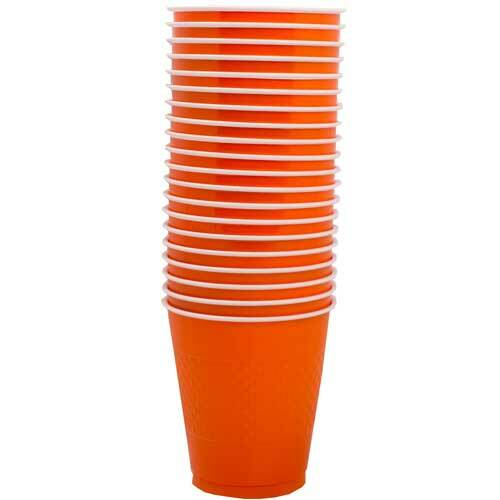 Orange Cups are great for all occasions, including Halloween, Thanksgiving, birthday parties and barbecues. These medium sized cups are easily held and have a rugged design to help keep them from slipping out of your hand. The best part is when you're done, you can just throw them away. Orange Plastic Cups are shipped in 20 to a pack and hold 12 ounces each. Love the orange color and want your other party supplies to match? Or love the cups and want a different color? Check out our other party supplies under 'Other JAM'n Products You Might Like' for a sneak peek at wide collection!